It is relatively rare to be diagnosed with Vulvar Cancer in your 20's as I was, it is much more common in women over 65! 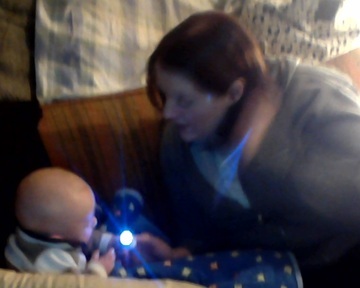 Is that a flashlight he's playing with? He looks fascinated ! Never mind, I read your experiences, your son. Thanks for posting, he looks like he's having fun taking a ride. Posting pics of an irresistibly cute baby is one way to rack up lots of "likes" and goodwill points quickly - haha!! Procedure or Surgery (Surgery): I went in for my surgery and radiation treatment in Feb but only the surgery part was done and no radiation. I will have to go back for that after I heal from this. Decision Point (Where am I going to make a new home for my son and I to live? ): As of May 2013 I am in my own apartment, my son and I are so happy to have a place of our own. Hayden is 5 months old and we are happy in our own little home.